Bosnia and Herzegovina prepares for the crucial matches in the battle fto reach the World Championship in Qatar. The road to Doha will be quite difficult due the fact that Iceland has an experienced squad with plenty of quality players, but Bosnian head-coach Dragan Markovic and his players refuse to wave the white flag before the final whistle after 120 minutes. The Bosnians are seeking to repeat the success of their football colleagues, who reached this summer’s FIFA World Cup in Brasil. “I said already a few times that Iceland has a great team and that they play very good handball. They have a lot of good players, but honestly, I don't think too much about them. I am focused on our game. I wish to prepare a few surprises for my colleague Kristiansson,” said Markovic at the team’s press conference in Sarajevo. Markovic praised his squad and individual qualities of the players: “We are covered with good players on every position. I am satisfied with the players’ performance in their teams during the season. Our defensive performance could be crucial for victory, but we have to give our very best in every part of the game,” added Markovic, who will have a dual function from the next season, as he becomes head coach of Polish team Azoty Pulawy. 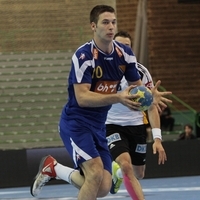 The biggest problem for the squad is an injury to the team’s biggest name, Veszprem left back Mirsad Terzic. “He is a very important player in our system, but we have already played without him. It is simple, we have to play without him, it will be tough, but that is another challenge we are facing. “The guys are doing good job, they are working hard and that makes me happy. Iceland will be without Palmarsson, but they have also Gunnarsson, who can replace him at the highest possible level. Motivation is not something Markovic has to worry about. Bosnia and Herzegovina is yet to qualify for a major championship and this is the end of the third qualification cycle for the current head coach. “I wish to qualify for the World Championship. I believe that we will make it now,” said Markovic. The Bosnians would be happy with any positive result in the first match at “Mirza Delibasic” hall, where will two sides meet on Saturday, 7 June 20:15 hrs. local time. “We are looking for any kind of victory. It would be nice that Iceland starts from behind in the second match. More goals, of course, would be perfect. I wish to call the fans to come and support us. They are a very important part of this battle,” concluded the Bosnian coach. Line players: Muhamed Toromanović, Vladimir Vranješ, Senjamin Burić. The second leg is scheduled for 15 June at 17:30 hrs. in Reykjavik.